Don't fumble around with wires or fuss over the computer; present like a professional and control your computer remotely, using just one device - the Targus Multimedia Presentation Remote with Cursor Control. Thanks to the remote's 2.4 GHz cordless technology, you can access programs, launch the Internet, adjust volumes and play music and videos, all from up to 15 meters away. The Targus Multimedia Presentation Remote will give you the freedom to concentrate on your Microsoft PowerPoint or Apple Keynote presentation, without having to worry about making mistakes - the system's patented KeyLock technology locks non-essential keys, meaning you can't press them accidentally. Walk around and take the presentation at your own pace. You can even dim the lights if necessary as the remote has backlit buttons for use in low-light environments. The easy-to-guide, bright laser pointer and cursor controls will enable you to access your computer and move your presentation along smoothly and efficiently. The mini USB receiver stores neatly inside the remote when it's not in use for added convenience, so it won't get lost or damaged. There's no need to worry about losing power part-way through your presentation. Should your AAA Energizer MAX battery run out, there is a back-up battery compartment where you can store a spare battery. 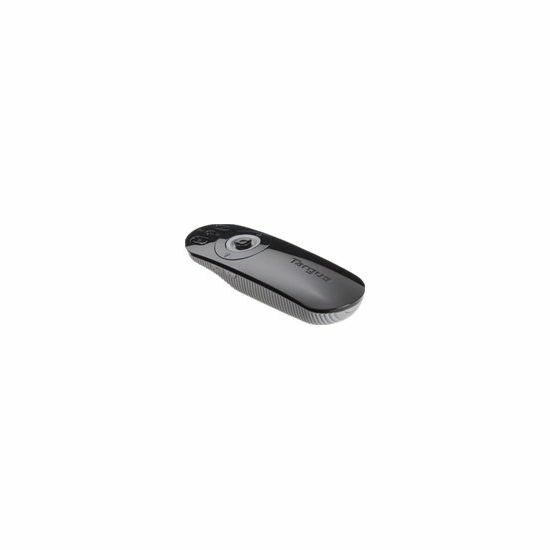 Present the professional way with the Targus Multimedia Presentation Remote with Cursor Control.